Sixth forms across Merton have seen their best-ever A-Level results with provisional figures showing an increase in pupils achieving the top grades this year as well as an improvement in every grade band as students received their A-Level results yesterday (13 August). Overall, the number of students achieving A* – A grades this year rose 5% in comparison to last year to 25% with half of students awarded A* – B grades, up 7% on last year. The Leader, Cllr Stephen Alambritis and cabinet member for education, Cllr Martin Whelton with students from Rutlish and Ricards 6th Form. Merton performed better than the national average for both A* – E grades, achieving 99% against 98% and A* – C grades, 79% against 77%. This represents a 1% improvement on A* – E grades and a 7% improvement on A* – C grades compared to last year. Raynes Park High saw 22% of students achieving A*- A grades this year, 7% up from last year as well as a 10% increase in A* – B grades which stand at 39%. Rutlish High School saw an increase in pupils achieving A*- A grades, up 11% from last year to 30%. A*- B grades were up over 20% from last year to 56%. Ursuline High School saw an improvement in A* – A this year for the fourth year running going against the national trend and saw A* – B grades up 3% to 59%. Wimbledon College saw A* – A grades up 5% from last year to 22% with A* – B grades also up on last year to 44%. St Marks Academy saw A* – A grades up 9% on last year to 21% and A* – B grades up 12% to 43%. 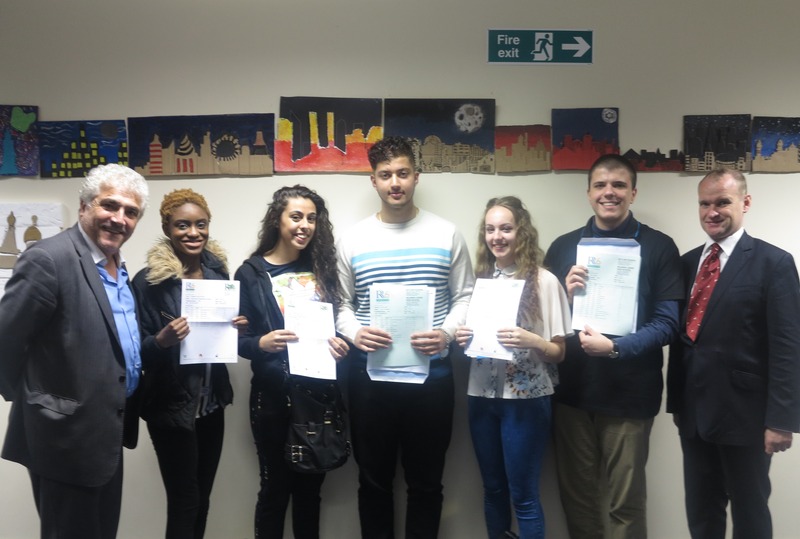 Merton Council cabinet member for education Councillor Martin Whelton said: “It is fantastic that Merton schools have seen their best-ever A-Level results with 25% obtaining A* -A grades and 50% obtaining grade B or above. There has been many outstanding achievements this year in our schools and I am delighted that so many of our young people are now going on to top universities. I would like to congratulate all of our A-Level students on their results along with the commitment and dedication they have shown to their studies. “Whatever they now do in the future, whether it’s education or work, we know that many of our students will go on to achieve great things in life. My thanks to their teachers for helping them achieve such fantastic results and to their families who have supported them through their school years.